2 Selby Cottage was built in the 1600's as the village bakery. It is a really comfortable 3 bedroom cottage located along a quiet lane yet 2 minute walk from the 12C Church, 16C pub and an Indian Restaurant. The cottage is the perfect base for exploring a 5 minute drive takes you to Duxford Imperial War Museum and Shepreth Wildlife Park. Yet central Cambridge, Grantchester, Wimpole Hall, Audley End house and Royston can all be reached within 20 minutes and London Kings cross can be reached in under an hour. The village is steeped in history, from the ancient round moat, mentioned in the doomsday book as Fuglesmare, the 12C (in parts) St Mary's Church. The RSBP Nature reserve was a large lake, the ancient trackway Ickneild Path runs at the border of Fowlmere. There used to be a satellite airport here in both the first and second world wars and the Mustangs and Spitfires were based here. Today we just have a small private airport at Manor Farm with a war memorial. Samuel Pepys mentions the pub in his diary in the 1600's when he stayed in Fowlmere on his way to Cambridge. The cottage has a stunning Inglenook fireplace in the lounge along with leather sofa, flat screen tv, dvd player and Now TV box. The large kitchen dining room is the hub of this house and is fully equipped with double oven, grill and hob, to coffee machine and dishwasher. There is a wooden garden room where you can relax and enjoy the garden. Upstairs the main bedroom has a 4 poster bed and walk in beamed wardrobe. There is a twin bedroom with plenty of storage and a smaller 3rd bedroom with 3" wide bunk beds. These are suitable for adults but, as there is reduced head room we do not recommend them for adults on long stays. There is a modern white bathroom with shower over the bath. Outside there is a pretty garden with a patio table and chairs and a trampoline. There is parking for one car in the driveway. I live about half a mile from the cottages in the village with my Husband, two teenage boys and our Kooikerhondje dog. I walk daily and you will find lots of photos on our Cambridgeshirecottage Facebook, Instagram and Twitter pages. I love travelling and have travelled extensively both with my job in IT and for leisure. I love picking up little ideas that I can use at the cottages to make our Guest's stay as comfortable as possible. My Husband Paul bought this cottage he wanted somewhere unique with character in a village close to Cambridge and with easy access to airports and London for work. Top priority was a big kitchen as he loves to cook and fantastic places to eat and drink nearby. The bonus as he has been into planes since he was a child has to be the proximity to Duxford IWM and the small airport in Fowlmere where he was able to fly small aircraft. 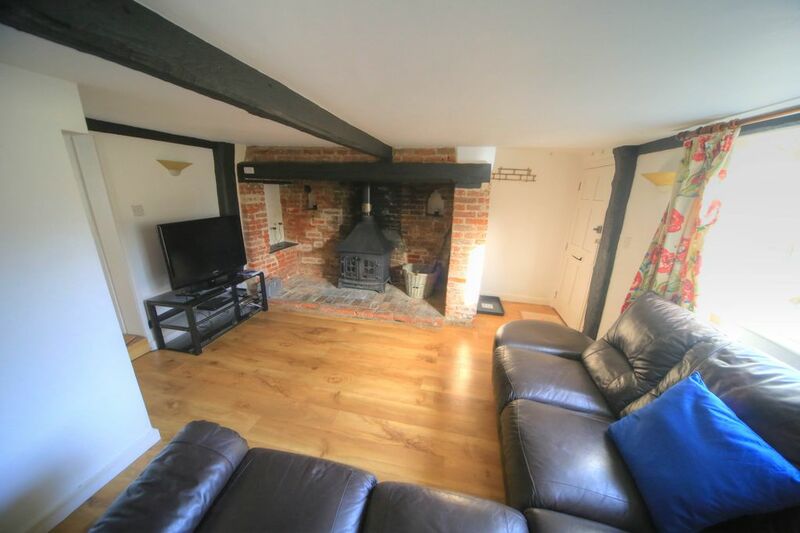 This is a character cottage with wonky walls, beamed ceilings and stunning Inglenook fireplace but, the big bonus it the good sized kitchen dining room making it perfect for a self catering holiday. It really is a home away from home with numerous Guests extending their stay with us and returning year after year. The cottage is totally unique and well situated to explore the Cambridgeshire area. White bathroom suite with powerful shower over the bath. A lovely cottage in a lovely location. Service was great from the point of booking right through to the warm welcome when we arrived. Well equipped property with everything you could want whilst away to make it a home from home. This included a generous welcome pack along with a lot of extras about the property so no problems if you left something at home. Would definitely return if visiting the area again. Duxford Imperial War Museum, Shepreth Wildlife Park, Fowlmere RSPB Nature Reserve, Royston Cave, Wimpole Hall (National Trust) and working farm. Audley End House, Kings College Cambridge, Punting, Fitzwilliam Museum Cambridge, Cambridge Botanical Gardens. Kingsway Golf and Foot Golf. Newmarket Race course, Gog Magog Golf, Punting. Picnics, Wicken Fen.